THE ROMANY LIFE: We Have SOLAR POWER! We are SO excited! We took the plunge and spent a LOT of money (to us) and invested in a solar system for our camper! WOW are we excited. Solar has come a long way in the last few years, and it has now reached the point that it is extremely worth-while for us. While we haven't had a chance to really put it to the test, we are certain it is going to be a dream-come-true for boondocking, which is our favorite style of RVing. This is our new controller panel. 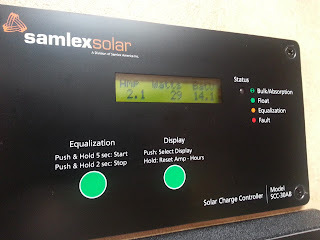 It gives us several digital display options in order to understand the current state of our new (again, very expensive) batteries and how many amps our panels are shooting into them at any given time, and more. Like most people familiar with solar power will tell you, you can load up your rooftop with great big solar panels, but your system will be limited by the strength and capacity of your batteries, and they are a major upgrade from what your RV will come from the factory with. Our Lance Camper came pre-wired for solar, but they had to do some wiring anyway because the location that the wires terminated was not desirable (in the bedroom). Otherwise, the camper was quite happy to become solar powered. We added two, 100 watt panels to our roof, that fit perfectly on each side of our large sunroof in the cab-over area (bedroom). That part of the camper is slightly canted and if we would like to increase our charging ability in the winter, we can simply park the truck facing south to receive the most direct hit of winter sun. So far, the camper has remained fully charged since we got the system. We have done very little traveling though, so we haven't really had a chance to put a big load on it. But not for long!! In just two weeks we are leaving for our biggest adventure yet: a whole MONTH of travelling! We have never had the chance to do this before, and we are beyond excited. It's still summer-time and we are going to see how many nights we can actually boondock and not use a paid campsite. As I have described before, what we do is not so much "camping" as it is "travelling". We spend our days parked at attractions, in parking lots at businesses and restaurants and parks and cool places... we don't care so much where we "sleep". The Lance Camper is ideally set up for solar because they come standard with nearly everything in the camper being DC powered. The ONLY things that aren't battery-powered are the air conditioner and the microwave and the AC outlets. Literally everything else runs off of the battery, even the TV and stereo. It's quite awesome. So stay tuned for our next big adventure, I will be posting the details about that soon! And... YAY SOLAR! !